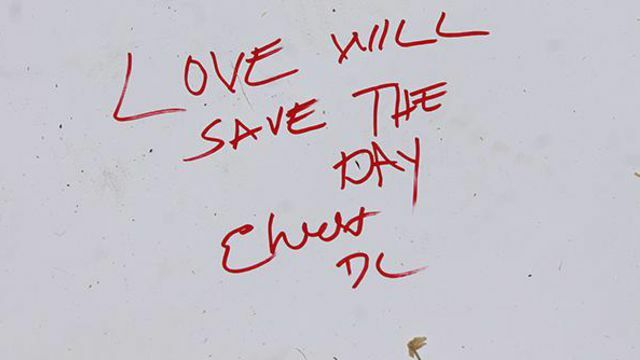 Message on a Gay Pride banner in Washington, D.C., June 13, 2016. I can remember my first time being there. They played music that I actually listened to, that I could actually dance to, and that bewildered me... It opened my life to a whole new world. Reps from the three major labels will sit down with reps from SPOTIFY, YOUTUBE, PANDORA, SIRIUS XM and more next week in a cross-disciplinary meeting that will kick off the BERKLEE COLLEGE-sponsored OPEN MUSIC INITIATIVE. The goal of the OMI, formally announced MONDAY, is to create an "open-source framework for music rights and music rights licensing," in the words of PANOS PANAY, managing director of BERKLEE's INSTITUTE OF CREATIVE ENTREPRENEURSHIP. In other words, metadata standards that will allow companies and databases to talk to each other and make it easier for artists and other rights holders to get paid. It's not the first attempt to clean up the tangled mess of metadata and money that is the digital music space, but the list of participants suggests it's the first with a chance to work. Glaringly absent from the list of founding companies, though: APPLE... That's especially glaring because APPLE MUSIC is now the fastest-growing streaming service, at least according to APPLE. A much-needed redesign unveiled MONDAY will add lyrics and various SPOTIFY-like features while de-emphasizing CONNECT, the latest in a long line of features which no one, including APPLE, knows exactly what it does... SHOWTIME has put an edited version of the "ROADIES" series premiere on YOUTUBE... The stream of stories about the power of dance on my social feeds has provided a much-needed uplift over the past couple days. Typing the names below made me cry. RIP STANLEY ALMODOVAR III, AMANDA ALVEAR, OSCAR ARACENA, RODOLFO AYALA, ANTONIO DAVON BROWN, DARRYL R. BURT II, JONATHAN CAMUY, ANGEL LUIS CANDELARIO-PADRO, OMAR CAPO, SIMON CARRILLO, LUIS DANIEL CONDE, CORY JAMES CONNELL, TEVIN EUGENE CROSBY, ANTHONY LUIS LAUREANO DISLA, DEONKA DEIDRA DRAYTON, LEROY VALENTIN FERNANDEZ, MERCEDEZ MARISOL FLORES, PETER O. GONZALEZ-CRUS, JUAN RAMON GUERRERO, PAUL TERRELL HENRY, FRANKIE HERNANDEZ, MIGUEL ANGEL HONORATO, JIMMY DE JESÚS, JAVIER JORGE-REYES, JASON BENJAMIN JOSAPHAT, EDDIE JAMOLDROY JUSTICE, CHRISTOPHER LEINONEN, ALEJANDRO BARRIOS MARTINEZ, JUAN CHAVEZ MARTINEZ, BRENDA LEE MARQUEZ MCCOOL, GILBERTO RAMON SILVA MENENDEZ, KIMBERLY MORRIS, AYKRA MURRAY, GERALDO A. ORTIZ-JIMENEZ, JOEL RAYON PANIAGUA, JEAN CARLOS MENDEZ PEREZ, ENRIQUE L. RIOS, ERIC IVAN ORTIZ RIVERA, JEAN CARLOS NIEVES RODRIGUEZ, XAVIER EMMANUEL SERRANO ROSADO, CHRISTOPHER SANFELIZ, YILMARY RODRIGUEZ SOLIVAN, EDWARD SOTOMAYOR JR., SHANE EVAN TOMLINSON, MARTIN BENITEZ TORRES, JUAN P. RIVERA VELAZQUEZ, LUIS VIELMA, LUIS DANIEL WILSON-LEON AND JERALD ARTHUR WRIGHT... RIP also to MEMPHIS songwriting great CHIPS MOMAN and salsa pianist JOSÉ LUGO.